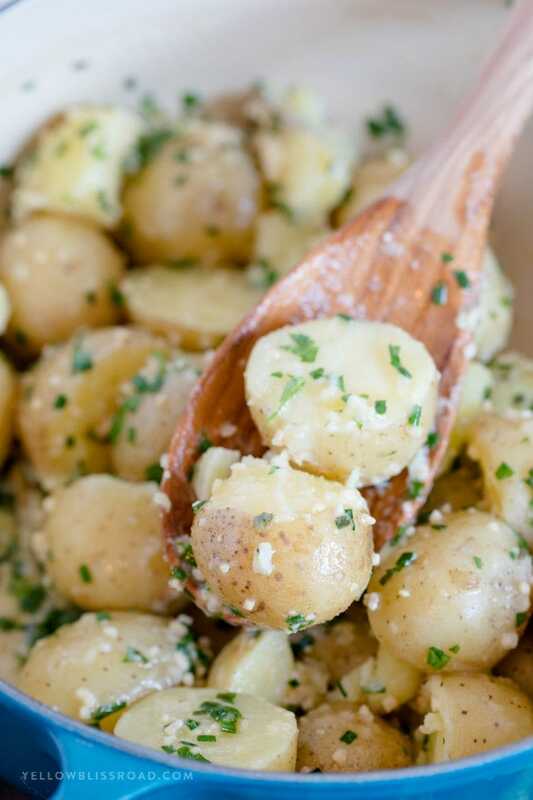 These Garlic & Herb Butter Baby Potatoes are creamy, tender and bursting with flavor, making them a perfect, quick side dish to any meal. When it comes to potatoes, I’m an equal opportunity connoisseur. Mashed potatoes, potato waffles or twice baked potatoes, I enjoy them all. But you know what they all have in common? They take so much time to make! The boiling, the baking, the shredding, the mashing, whichever recipe you’re making it calls for multiple steps with different cooking methods and mixing. You know what doesn’t have a ton of work involved? 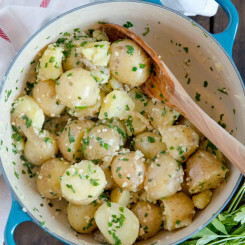 These Garlic & Herb Butter Baby Potatoes. First off, what are baby potatoes? They are those adorable little yellow skinned potatoes, similar in shape but much small than red potatoes. They are ultra creamy and because of their small size they don’t take long to cook. A 2-pound bag yields around 20-25 small potatoes. Since they can vary quite a bit in size, you may need to cut them in half or even quarter them if they’re really large. I’d say about 50% of what was in my 2-pound bag need to be cut down, and only a few of those needed to be quartered. Before cutting them to size, you want to make sure to scrub them with a clean vegetable scrubber to remove any dirt or bacteria, especially since you’ll be eating the skin. Put all of the potatoes in a large pot and add just enough water to cover them. Bring the water to a boil, then add a couple teaspoons of salt. 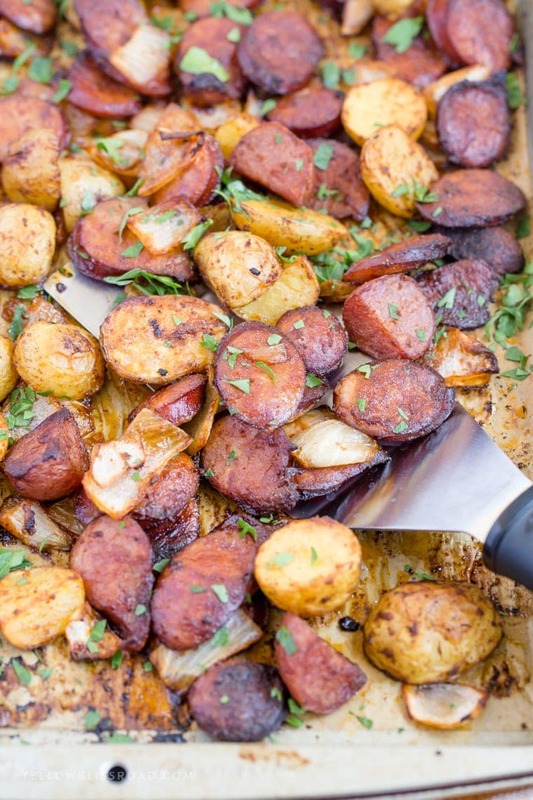 Potatoes absorb the salt while their cooking and it helps bring out their natural flavors. After about 10 minutes, test them for tenderness with a fork. The fork should slide easily into the potato, breaking it apart just slightly. Cook them too long and they will fall apart completely. 10-15 minutes is a good measure of time. Once they are tender to your liking, drain the water and keep the potatoes in the pot on the stove. Add the butter, chives, parsley and minced garlic. (I’ll be honest, I use so much garlic in my cooking that I buy the large jars of chopped/minced garlic from the grocery store. Makes my life just a little bit easier.) Potatoes retain their heat quite nicely, so the butter will start to melt immediately. Stir it all up so the the potatoes are nicely coated with the butter, garlic and herbs, then put the lid on and let them sit for 10 minutes or so and steep in all that buttery, garlicky, herb-y goodness. You can also serve them right away, but they soak up the flavor more if you let them sit for a bit. Let me tell you, the flavor is amazing! They are by far the best potatoes I’ve ever had, and they took less than 20 minutes to make! During that 10 minutes that they’re sitting on the stove I was finishing up the rest of dinner, calling my kids to the table and getting hands washed. This is such an easy-peasy, fix it and forget it side dish, making it perfect for when you want something hearty to add to your weeknight meal. They’re also quite pretty, making them a sure winner for your holiday table. 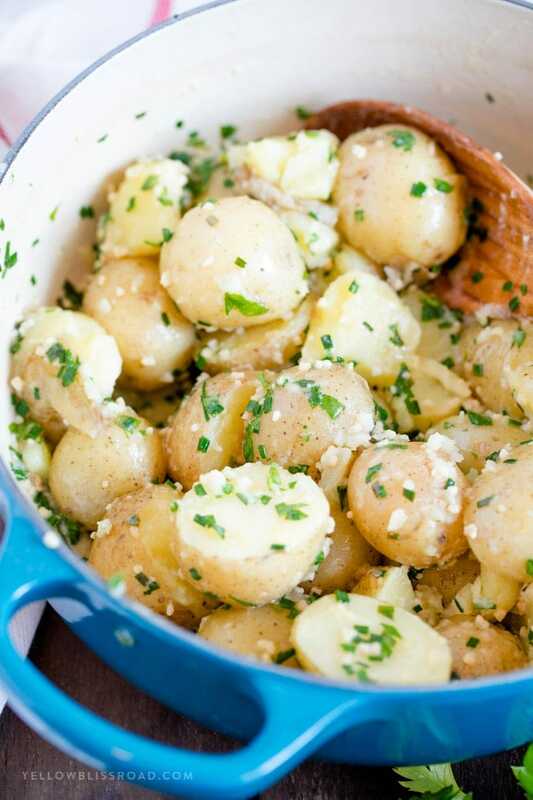 These Garlic & Herb Butter Baby Potatoes are creamy and tender and make a perfect, quick side dish to any meal. Scrub potatoes clean with a clean scrubber. Cut any larger potatoes in half or quarters so that all of the potatoes are uniform in size. Place in a large pot, cover with water and bring to a boil. Add 2 teaspoons of salt to the water. Turn heat down to medium and boil potatoes until fork-tender; about 10-15 minutes. 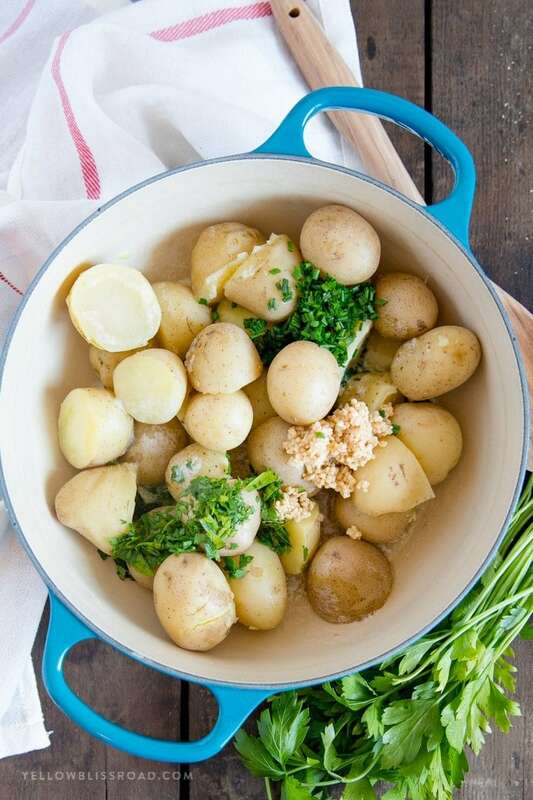 Turn off heat, drain the water and return potatoes to the pot. 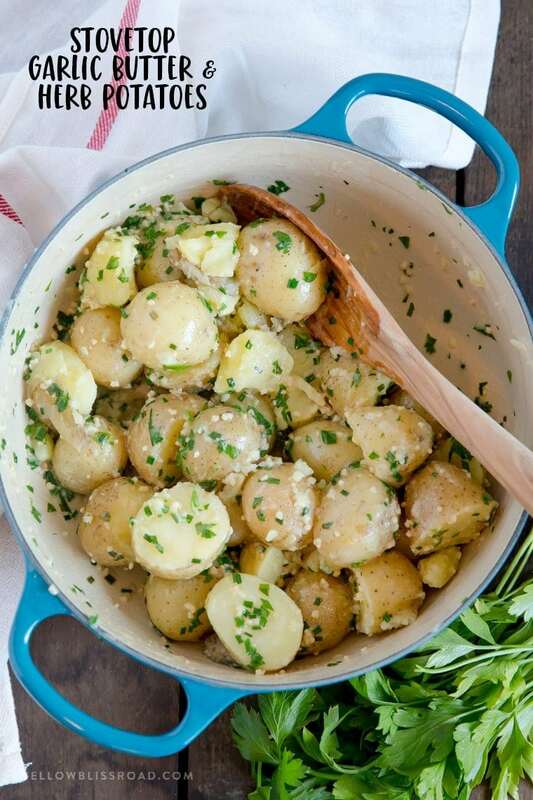 Stir in butter, garlic, parsley, chives and 1/2 teaspoon salt until potatoes are well coated. Cover and let sit for 5-10 minutes, then serve. Season with more salt and pepper if desired. Husband’s new favorite potato recipe! Hi Kerry,so happy that you and your family loved this recipe!